Do you like peanut butter? Chocolate? Peanut Butter Cups? If you answered yes, then you are going to love this recipe. Instead of make peanut butter balls again this holiday season, make these delicious bars instead. I’ve made so many peanut butter balls that I swear I could make them in my sleep. Peanut Butter Balls are super delicious but so are Peanut Butter Bars and they’re easier. This recipe for Peanut Butter Bars, I found in one of my many, many Taste of Home cookbooks. The bars are made in a 15 x 10 x 1-inch baking pan or jelly-roll pan. This recipe will yield at least four dozen or more, depending on how big you cut the bars. The ingredient list is the usual cast of characters one would expect; peanut butter, butter, sugars, eggs, flour, and oatmeal. Making the bars fast, easy and relatively inexpensive. 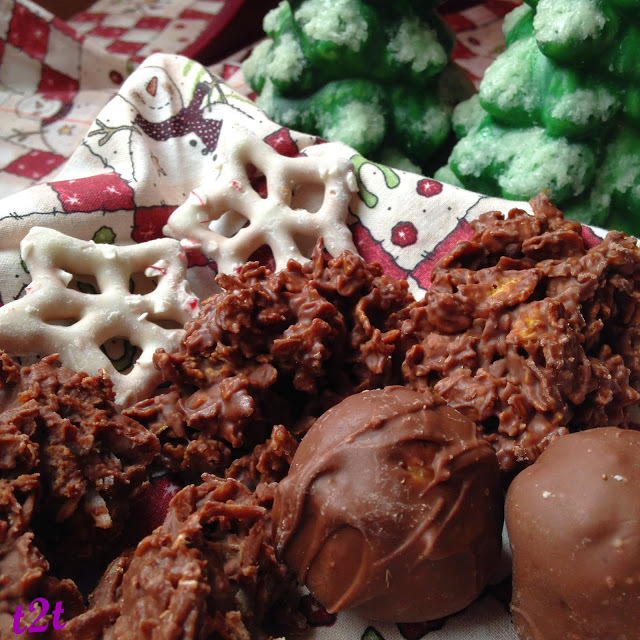 I’m not sure why or even when peanut butter balls become part of my holiday candy repertoire. I think it was was back in the early 80’s when my sister’s and I thought it would be a good idea to make Christmas candy together. On a scale of 1 to 10, I’d give it a 4. At one point, my sister’s and I thought it would be a good idea to go to ‘Sister Bay’ WI for the weekend but that’s a whole other story! So anyway, back to the peanut butter balls. 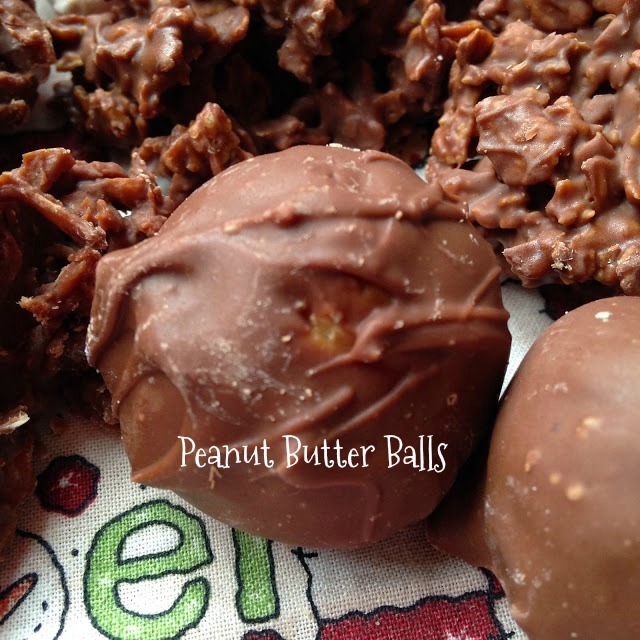 Peanut butter balls don’t necessarily need to be saved just for Christmas season. Make them anytime! Traditionally they are served during the holidays. 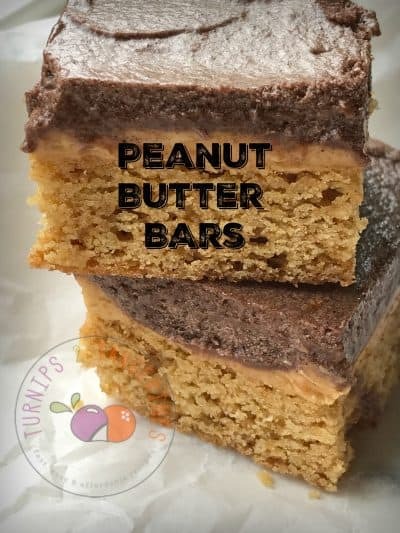 This year why not take a shortcut and make these peanut butter bars instead. I know you’ll hear lots of moans and groans from your family like I did. I told my kids if you want peanut butter balls, then you’ll have to come over and learn how to make them. They did and now do. 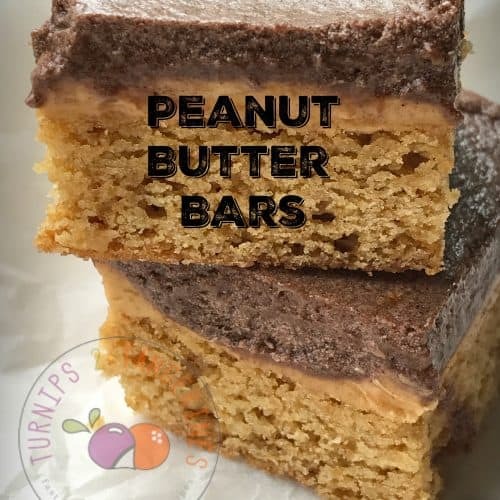 Peanut Butter Bars that taste just as good if not better than Reese's Peanut Butter Cups. In a large bowl, cream the butter, peanut butter and sugars until light and fluffy, about 4 minutes. Beat in the eggs, water and vanilla. Combine the flour, oats, baking soda and salt; gradually add to creamed mixture and mix well. Spread into a greased 15 x 10 x 1-inch baking pan. Bake at 325° for 18-22 minutes or until lightly browned. For glaze; in the microwave or in a double-boiler, melt chips and peanut butter; stir until smooth. Pour over warm bars; spread evenly. Cool completely on a wire rack before cutting. Like Peanut Butter? I Love Peanut Butter. I love peanut butter so much that could and often do eat it everyday. I can and do eat peanut butter by the spoonfuls too. 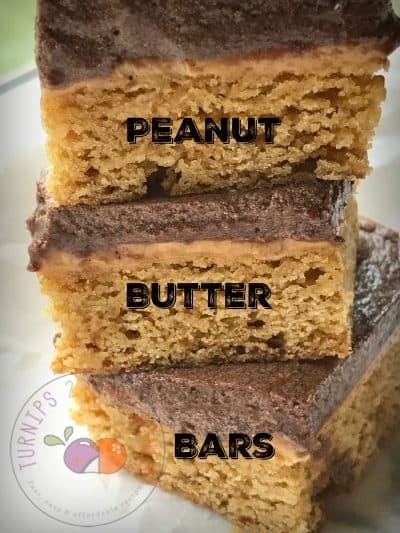 If you like peanut butter as much as I do don’t eat it by the spoonfuls, make these recipes instead; Peanut Butter and more, Peanut Butter Crunch Cake, and Peanut Butter Cup Crunch Brownie Bars. Whoops can’t forget Peanut Butter and Chocolate Bread. Peanut Butter used in this recipe: Jif Creamy Peanut Butter.